Wittmann Textiles Company: Cyber Monday Sale on cozy cotton products! Cyber Monday Sale on cozy cotton products! Wittmann Textiles is doing our first ever 2018 Cyber Monday Sale on some of our cozy hard to find cotton products. 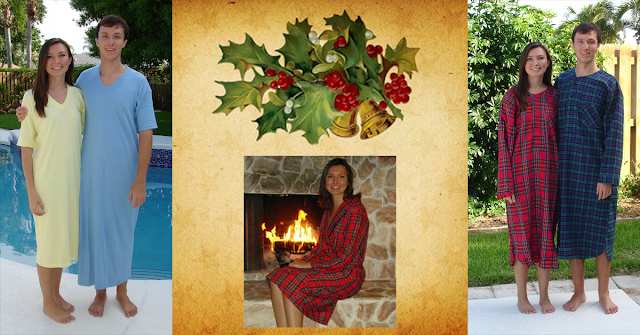 Our Nightshirt Cotton V-neck Tee-PJ, Cotton Flannel Nightshirt, and Ladies Cotton Stewart Plaid Flannel Robe are all on sale, along with other high quality cotton products. Kathy and Scott Wittmann will be just a phone call away to personally answer any questions you may have and assist in product selection, whether you are trying to find a perfect cozy cotton gift for that special someone or if Santa is getting tired from all this holiday shopping and needs comfortable sleepwear to rest up for the big day - here at Wittmann Textiles, we’ve got you covered!